Abdelhamid Abaaoud has long taunted 'crusader intelligence,' schoolmates reveal he was 'a little jerk' who stole and harassed. Belgian jihadist Abdelhamid Abaaoud, the suspected mastermind of the bloody Paris attacks, was a schoolyard bully who is now taunting police from his apparent Islamic State (ISIS) group base in Syria. Abaaoud, a 28-year-old of Moroccan origin, has been linked to a series of Islamic extremist plots and recruitment efforts in Europe over the past two years, but remains frustratingly at large. Now in the crosshairs of French and Belgian authorities over the massacre in Paris that left at least 129 murdered, Abbaoud has in the past boasted of a close call he had when he passed through a checkpoint as police studied a photo of him. "The kuffar (unbelievers) were blinded by Allah. 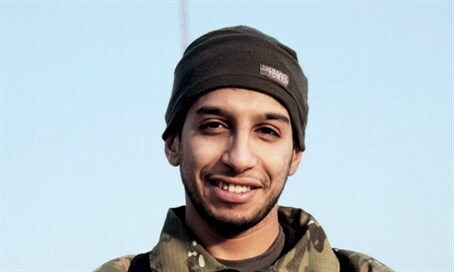 I was even stopped by an officer who contemplated me so as to compare me to the picture, but he let me go, as he did not see the resemblance!," Abaaoud told the Islamic State magazine Dabiq. "This was nothing but a gift from Allah," said a bearded Abaaoud who appears in an accompanying photo holding up a Koran in one hand and a black Islamic State flag in the other in front of a US-made Humvee. He also bragged about escaping from Europe after Belgian police shot dead two of his fellow terrorists as they broke up a cell planning terror attacks on security personnel earlier this year. Mocking the "bloated image" of "crusader intelligence," he gloated: "My name and picture were all over the news yet I was able to stay in their homeland, plan operations against them, and leave safely when doing so became necessary." It was after the break-up of that terror cell in the eastern Belgian city of Verviers in January, shortly after the Charlie Hebdo attacks in Paris, that Abaaoud's name began to widely circulate. In February, Abaaoud, who was reported at one time to be in Greece, claimed responsibility for the plot against police officers and said he had joined the Islamic State group in Syria. Abaaoud - who hails from Molenbeek, a grimy Brussels district dubbed a Muslim extremist "hotbed" - was sentenced in absentia to 20 years in prison in July for running a network to recruit jihadists to Syria. Abaaoud then boasted in videos about planning attacks in Europe. Born in Molenbeek in 1987, he goes by the nom de guerres Abou Omar Soussi, after the name of the family home in southwest region of Morocco, and Abou Omar al-Baljiki, meaning Abou Omar the Belgian. "He was a little jerk," recalled a former classmate from Brussels who told the Belgian newspaper La Derniere Heure that Abaaoud used to harass fellow pupils and teachers and also got into trouble for stealing wallets. Abaaoud apparently knows Salah Abdeslam, who also has roots in Molenbeek and who is wanted for allegedly taking part in the Paris attacks, and has appeared in Belgian police files linked to Abdeslam's brother Brahim, who police say blew himself up outside a bar in Paris. After the cell in Verviers was smashed, the father of Abdelhamid Abaaoud said his son had shamed the family and destroyed their lives. "Why in the name of God, would he want to kill innocent Belgians? Our family owes everything to this country," Omar Abaaoud, whose family moved to Belgium 40 years ago from Morocco, told La Derniere Heure newspaper Tuesday. "We had a wonderful life, yes, even a fantastic life here. Abdelhamid was not a difficult child and became a good businessman," the father was quoted as saying. "But suddenly he left for Syria. I wondered every day how he became radicalized to this point. I never got an answer," said the father of six children who lives in Molenbeek. As early as last year Abdelhamid Abaaoud was already known to security forces after appearing in an Islamic State video at the wheel of a car transporting mutilated bodies to a mass grave. In 2014, Abelhamid convinced his younger brother Younes, then 13 years old, to join him in Syria and the boy was dubbed the "the world's youngest jihadist" by some newspapers. "He got himself recruited by Abdelhamid and for that I will never forgive Abdelhamid," the father said.